This didactic procedure concerns a 63 y.o male, with medical history of CAD (Lcx already treated few months before, LAD CTO JCTO Score:4). First attempt of LAD recanalization has failed, The patient is still symptomatic despite OMT. The second attempt was a success with retrograde approach using IVUS guided retrograde puncture. How to approach patients with Symptomatic coronary chronic total occlusions. Optimal Application of the Hybrid algorithm in treatment of coronary CTO. Evaluation of the anatomical complexity of coronary CTO with combined angiography and IVUS. IVUS usefulness to decide strategy in coronary CTO procedures. 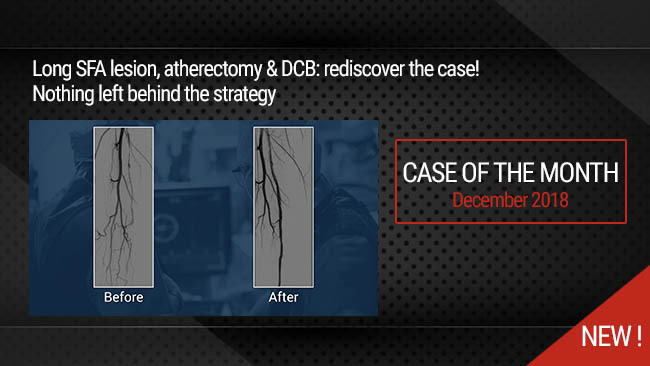 Step by step retrograde approach in coronary CTO procedures. IVUS guidance for safe retrograde and antegrade punctures. How to optimize sizing and stent implantation in Coronary CTO procedures. Double Femoral approach 7F introducers. EBU 3.5 7F to the Left system and AL0.75 7F to the right system with two Sion blue wires for stabilization. IVUS assessment of the LAD Poximal CAP. Retrograde approach with Corsair microcatheter and surfing technique via PDA-septal connections using a Sion black guidewire. IVUS evaluation of the retrograde wire position. Retrograde puncture of the proximal CAP using a Confianza Pro 12 guidewire. IVUS evaluation of t the Confianza Pro12 wire confirming subintimal position in the Proximal LAD. Antegrade puncture using a Confianza Pro12 and Finecross microcatheter. Progession antergradelly using Finecross microcatheter and Sion black wire. Confirming the distal position with safe Tip injection. IVUS evaluation of the antegrade wire and LAD sizing. Predilatation and stenting of Ostio-proximal LAD with Promus 3.0x32mm DES. Stenting of the Mid-LAD with Promus 2.5x24mm. Final angiographic and IVUS control and Optimization. Authors:Brilakis ES, Grantham JA, Rinfret S, Wyman RM, Burke MN, Karmpaliotis D, Lembo N, Pershad A, Kandzari DE, Buller CE, DeMartini T, Lombardi WL, Thompson CA. Authors:Song L, Maehara A, Finn MT, Kalra S, Moses JW, Parikh MA, Kirtane AJ, Collins MB, Nazif TM, Fall KN, Hatem R, Liao M, Kim T, Green P, Ali ZA, Batres C, Leon MB, Mintz GS, Karmpaliotis D.